Adjust the brightness: long press power switch to adjust the brightness from the current brightness to 100%, and loosen and then long press the power switch to adjust the brightness from 100% to 15%. It is only compatible with M-Edge Jackets for the Kindle Latitude, Executive, Go, and Trip Series cases. - Support arm allows for easy storage in sewn-in jacket pocket. Our main warehouse is located right outside of Baltimore, Maryland. 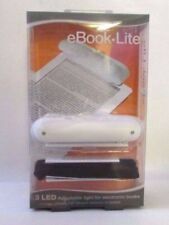 Kandle LED Book Light eReaders Bone Color Perfect UNUSED Extra Batteries & Pouch. Shipped with USPS First Class Package. Brand New Maxell Maxlink EReader Light Black Clip Onto Screen Portable Free Ship. Condition is New. Shipped with USPS Retail Ground. Read your books on the go without disturbing people around you with the eBook Reader LED Travel Booklight! Mini book a lot of practical, can be placed on the desktop when the small lamp use, can be clamped on the book to read, can be clamped in the hat to go camping, can be used for night fishing, think of how to use it to use, when not in use can be put in the pocket, so it is very convenient. Adjust the brightness: Press and hold the power switch to adjust the brightness from the current brightness to 100%, then release and then press the power switch to adjust the brightness to 100% to 15%. Illuminate your eReader or tablet with ultra-bright, glare-free technology and even coverage with the Fulcrum Multiflex ecoReader Book Light. Excel To HTML using codebeautify.org. Illuminate your eReader or tablet with ultra-bright, glare-free technology and even coverage with the Fulcrum Micro eReader Book Light. Excel To HTML using codebeautify.org. 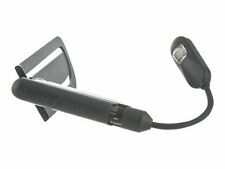 NEW LIGHTWEDGE VERSO WRAP LIGHT FOR E-READERS. SimpleLight Amazon Kindle 4th Generation Only LED Reading Light new. Condition is New. Shipped with USPS First Class Package. Ultra-Bright LED light with Eye-Friendly Frosted LED Panel, perfect for reading without straining your eyes or disturbing others. 1 x Reading Book Light With Detachable Clip. Type:USB Light. Due to the different monitor and light effect,the actual color maybe a slight different from the picture color. ® Flexible USB Powered LED Reading and Keyboard Light For Computer Laptop Notebook and Power Bank. Small, Light Weigh, & Portable. Use Anywhere ~ USB Port Powered. Easily adjust the Direction of Light by bendingHighly Flexible Articulated Neck. Lewis N. Clark eReader / Book Light. Contemporary and compact light features three bright LED’s and rotates 90 degrees for easy positioning and custom screen illumination. Wide base also allows for free-standing use. 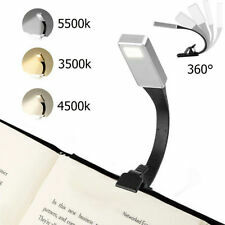 1 x 1 LED Clip On Reading Book Light. Light color: white. Due to the difference between different monitors, the picture may not reflect the actual color of the item. Color: Black. Powered: 2 x CR2032 batteries. NEW LIGHTWEDGE VERSO ARC LIGHT FOR E-READERS. Kandle portable light for e books. New in box. GREAT FOR DESK, BEDS, END TABLES, ETC. CLIP ON LIGHT. GREAT FOR READING. This is made for Nook 1st and Nook 2nd Edition. Two energy-efficient LEDs cast bright white light. Use one or two LEDs by tapping button. Precisely engineered optical grade lens spreads light evenly. E-Luminator Touch E-Reader Book Light. This book light requires 1 AAA battery which is not included. This has a bendable arm for adjusting where needed.There is a off and on button on the top of the arm just slide base where you want and turn on. 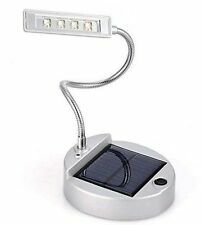 Kandle LED Reading Light Designed for Books and E-readers, White NEW. Condition is New. Shipped with USPS First Class Package. New patent-pending WideLip™ design attaches to the Kindle™, Sony® Reader and other eBook readers without blocking the screen. 1/3 LED lights not working. Includes 2 CR2032 batteries installed (plus an extra set of batteries) and protective pouch. 2 different levels of brightness. Runs on AAA Batteries (3 - not included) or USB Powered (USB cable included). Options of single or double pole use. N EW. Verso Wrap Light for e-readers- White. Even illumination, no glaring hotspots. ITEM IS IN NEW CONDITION AND NEVER BEEN USED. When the backlight just isn't enough, you can use a reliable reading light with your favorite tablet or eBook. With numerous options for style, functionality, and light intensity, it's possible to find a product that fits your needs. You can expect your reading light to provide the extra illumination necessary to enjoy your favorite eBooks and tablet content anywhere. What styles of reading lights are available? 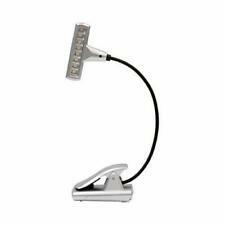 There are a number of different styles of reading lamps you can buy to enhance your reading experience while using your tablet or eBook. One model involves an LED light attached to a flexible neck that clips to a flat surface, such as the top of an e-reader. Another style involves two lights and is worn around your neck, pointed down towards the screen in your hands. Other models are USB connected, plugging into a computer. Can you use different devices with a reading light? 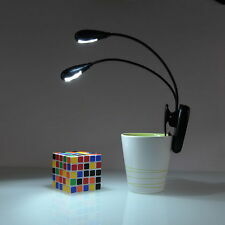 Virtually any handheld device can make use of a lamp's illumination. Both the Amazon Kindle and Barnes & Noble Nook are two common options. Other kinds of tablets, such as Google's Nexus line, also work well with these LED lights if you would rather not use the normal lighting levels on the device. What are some brands of reading light? HUGlight - This brand specializes in hands-free lights worn around the neck. Lightwedge - Lightwedge lamps are super bright LEDs with flexible necks that clip to a device, giving you more control over where your light is pointed. LuminoLite - These products also utilize the clip-on technology and include rechargeable battery functionality. Lyra Light - Made by Barnes & Noble, this lamp features a clip design with a square-shaped head fixture. 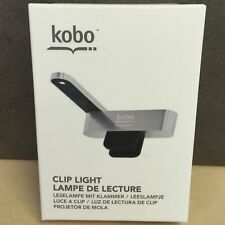 Kobo - These lamps clip to the top of a device. They have a wide body and a light that shines down across the screen fixed to a parallel bar. How long is the battery life on a reading lamp? This depends heavily on the type of lamp you own. Smaller lights often have shorter battery lives due to having less space to house batteries. Many lights will fall within the range of 10 to 50 hours of continuous lighting before dying, with different means of repowering them after that. While some will be equipped with USB connections to recharge from your computer's ports, others will take batteries (typically a lithium-button battery or other small-grade options). Additionally, bulbs may burn out over time, too.